Local tradition identifies this as the site of an 8th century oratory that was dedicated to St Florentius. A church with this dedication was documented as a possession of the canons of the Duomo in 1038 (although this document is perhaps a forgery). It was documented among the possessions of the Camaldolesian Abbazia di San Salvatore di Monte Acuto from 1059. It subsequently featured prominently in the archives of the abbey, and probably acted as its outpost in Perugia. St Florentius was believed to have been buried in Santa Maria di Monterone (later Santa Maria delle Grazie), outside Perugia. This church was characterised as dependent upon San Fiorenzo in a bull of Pope Eugenius III in 1145. At some point, the relics of St Florentius seem to have been translated from Santa Maria di Monterone to San Fiorenzo (presumably for greater safety). Both churches, like their mother house, passed to the Cistercians in 1234. San Fiorenzo is mentioned in the legend of Raniero Fasani, who lived as a hermit in Perugia in ca. 1263, and of “St” Bevignate. While the former prayed before an image of the Virgin, he saw her crying, presumably because of the sinfulness of mankind, and resolved to devote himself to preaching penance and promoting the practice of self-flagellation. An unknown companion appeared, who identified himself as brother Bevignate. Together, they went to San Fiorenzo, managing to enter it despite the fact that it was closed. The sacristan who found them inside the locked church was moved to submit to a life of penance. In 1348, at the height of the Black Death, the Cistercians of found the headless body of St Florentius beneath the high altar of San Fiorenzo, and paraded it through the city. St Florentius became an important plague saint in Perugia from this point: a similar procession was held, for example, during the plague of 1400. San Fiorenzo passed in commendam to Cardinal Enrico Minutoli at some time before 1394. 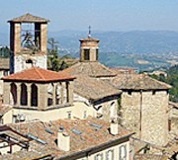 In 1393, Pope Boniface IX recognised the quasi-Cistercian Congregation of Corpus Christi, moved its headquarters to Santa Maria in Campis, Foligno, and gave the Abbazia di San Salvatore jurisdiction over it. 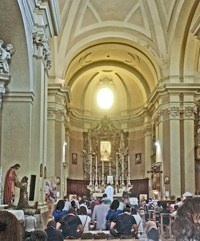 This congregation, which had been initiated at Gualdo Tadino in 1328 under the auspices of Bishop Andrea Vincioli of Nocera Umbra, had a particular veneration for the Eucharistic blood of Christ. The group of eight mostly Umbrian monasteries that belonged to this congregation included that at Bosco di Bacco, outside Perugia. When the monks were forced to leave it, Cardinal Minutoli gave them the church of San Fiorenzo. The Cistercians at Sant’ Ercolano became dependent on those of San Fiorenzo at that point. Thus, San Fiorenzo was once more under the jurisdiction of San Salvatore. However, the cohesion of the congregation was not particularly strong, and San Fiorenzo joined Santa Maria in Campis in transferring to the jurisdiction of the Cistercian Abbazia di San Galgano in 1395. In 1444, Pope Eugenius IV transferred San Fiorenzo to a group of Servite Observants from Santa Maria dei Servi, at the behest of the reforming Cardinal Domenico Capranica. They began the protracted rebuilding of the church and convent. The Servites therefore commissioned the Gonfalone di San Fiorenzo (see below) during an outbreak of plague in 1476, and housed it in a tabernacle (1480) on an altar in the church. The Commune made a contribution towards the cost of this tabernacle. ✴he designated St Florentius as a patron saint of Perugia in 1634. The church, which is in the shape of a Latin cross with a single nave, was rebuilt in 1763-70 according to a design that Pietro Carattoli produced shortly before his death in 1766 The originally rectilinear apse and transept chapels were reduced in size and given semi-circular floor plans, and two Gothic chapels off the left side of the nave were walled up. The convent was suppressed in 1863 and is now in secular use. The church continued to serve the parish until relatively recently. It is now used by the Orthodox community of Perugia. There are interesting remains, including a bifore window, in the campanile, which is to the left of the church. The door by the column on the left side of the church (pictured above, to the left) leads to what is now the University of the Third Age: if it is open, you can see the 15th century cloister of what was the monastery attached to the church. The relics of St Florentius are preserved in a wooden casket (17th century) under the altar. One of its long sides has a painted image of the saint in military armour. This fresco above the altar in the presbytery was originally in a house in the nearby Vicolo della Madonna that belonged to the Confraternita di San Fiorenzo. This house, which passed to the ownership of the Servites of San Fiorenzo, was rented out in 1616. The new residents decided to plaster over the fresco, but the workmen were struck down when they attempted to begin the work. Bishop Napoleone Comitoli arranged for it to be detached and placed in the care of the Oratorian Fathers. This was hotly contested by the Servites of San Fiorenzo, and Bishop Cosimo de Torres returned it to them in 1633. It was finally translated to San Fiorenzo in 1646. It was installed in its present location in 1770, following the remodelling of the church. This detached fresco from the earlier church is now on the 2nd altar on the left. ✴The bust (ca. 1960) of Galeazzo Alessi is by Artemio Giovagnoni. ✴The epitaph remarks that San Fiorenzo had protected the remains for four centuries, and that the people of Perugia had returned to honour them in 1960. ✴A second epitaph to the left asserts that Galeazzo Alessi had been a friend of Michelangelo and Antonio da Sangallo, and had been esteemed by Pope Paul III, Pope Pius V, King Philip II of Spain and the Republic of Genoa. It was presumably Philip II who gave him the title recorded on the epitaph of Cavaliere di Portogallo (Knight of Portugal). These thirteen frescoes in the lunettes of the sacristy (reached from the right transept) depict the legend of St Florentius as told by Ludovico Jacobilli in the 17th century. Each of the scenes is described by an inscription below. ✴The first seven are by Matteucci Salvucci, who worked on them until his death in 1627. They include this scene, in which St Florentius and his colleagues are arrested because of their Christian faith. •the Blessed Giovannangelo Porro (beatified in 1737). ✴The altarpiece on the 1st altar on the left depicts the last communion of St Juliana Falconieri (canonised in 1737). The Servites of San Fiorenzo commissioned this banner, which is attributed to Benedetto Bonfigli and dated by inscription, during an outbreak of plague, using money left to them in the will of one Petrus Galiotti Gregorii Cantagallina. It was kept in a tabernacle (1480) that was paid for by the Commune, which was placed on one of the altars in the church. In the 16th century, the Confraternita di SS Simone e Fiorenzo had the right to carry it when it was taken in procession during outbreaks of the plague in order to secure the aid of (among others) St Florentius. The brothers still performed this function as late as the 17th century, notwithstanding the poor condition of the banner. By the early 19th century, they had become the official custodians of the banner, and in 1807 they moved it to a new altar that they had constructed in the right transept of the church. It was moved to the Museo Capitolare in 2006, and has been replaced in the church by a copy. ✴Filippo di Ansideo di Simone de Catrano, who lived at the nearby Palazzo Ansidei, endowed the Cappella di San Nicolò in 1483. This was on a pilaster in the nave at the junction with the left transept. ✴Antonio and the heirs of Bernardino di Piergiovanni de Catrano (who belonged to a cadet Benincasa branch of the Ansidei family) endowed the Cappella del Beato Filippo Benizi on the right wall of the nave in 1515. These chapels were dismantled when the church was remodelled in 1763. See also the page on the Palaces of the Ansidei Family. Giorgio Vasari recorded the presence of this altarpiece, which is dated by inscription, in the "Cappella dei Ansidei" of San Fiorenzo. In fact, as noted above, this family had two chapels in the church: however, only the Cappella di San Nicolò existed in 1505. Filippo di Ansideo di Simone de Catrano, who had endowed it in 1483, had also left money in his will in 1490 for an altarpiece, and it seems likely that Nicolò, his eldest surviving son, commissioned this altarpiece for that purpose. Vasari attributed the altarpiece to Raphael, and this has been universally accepted. It has been suggested that there are one or perhaps two further numerals after the date “MDV” on the Virgin’s left sleeve: however, this is not obviously the case, and stylistic considerations support the date 1505. The altarpiece depicts the Madonna and Child enthroned with SS John the Baptist and Nicholas of Bari (the name saints, respectively, of Nicolò and his son Giovanni Battista). These figures are set in a fictive chapel that seems to have been inserted (albeit seamlessly) into the composition at a late stage because the real "chapel" for which the altarpiece was destined was in fact on a pilaster in the nave. The fictive architecture would have asserted the importance of the location in the context of the grander recessed chapels further down the left side of the nave. The altarpiece probably remained in its original location until the remodelling of the church that began in 1763. The Servites sold the main panel and a predella panel of St John the Baptist preaching to the family of the 3rd Duke of Marlborough in the following year. Unfortunately, the other predella panel showing St Nicholas of Bari saving a sinking ship, has been lost. The surviving panels were displayed at Blenheim Palace, Oxfordshire until 1883, when they were "saved for the nation". They are now in the National Gallery, London. A 19th century copy of the altarpiece is on the second altar on the right of the church. Antonio and the heirs of Bernardino di Piergiovanni de Catrano (who belonged to a cadet Benincasa branch of the Ansidei family) commissioned this altarpiece from Sinibaldo Ibi for the Cappella del Beato Filippo Benizi, which they endowed in 1515 (as noted above). ✴The main panel, which depicts the Madonna and Child enthroned with SS John the Baptist, Philip Benizi, Florentius and Joseph, passed to the Accademia di Belle Arti in 1810 and is now in the deposit of the Galleria Nazionale. This altarpiece, which is attributed to Antonio Maria Fabrizi [and dated by inscription ?? ], is now in the deposit of the Galleria Nazionale. This is a new edition of the book published in 1991 by by Don Mario Moretti, the last parish priest of San Fiorenzo.